From by Rick Beyer and Elizabeth Sayles comes the fascinating story of this top secret unit, filled with artists, that used inflatable tanks, sound effects, and illusion to fool the Germans on the battlefields of Europe. Published by Princeton Architectural Press. 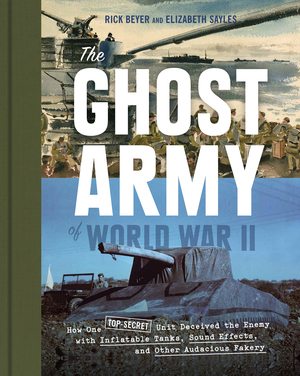 "The Ghost Army of World War II describes a perfect example of a little-known, highly imaginative, and daring maneuver that helped open the way for the final drive to Germany. It is a riveting tale ...I enjoyed it enormously."